This cute model was submitted by Edgardo Rivera. 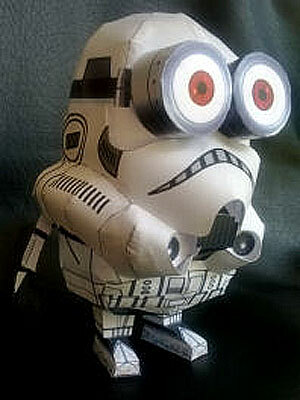 He made a custom minion papercraft again, this time he mixed it with Star Wars, a storminion. 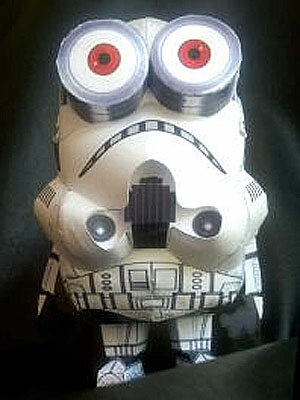 Storminion is a minion wearing a stormtrooper armor. 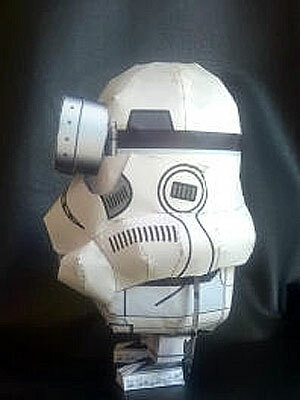 Beside recolor a minion template Edgardo also use parts from other papercraft, which is a stormtrooper helmet papercraft from Japanese papercraft designer Tomowo. The original helmet itself can be found at Tomowo's blog. There is no assembly instruction, you will have to figure out yourself by looking at the built photo by Edgardo. The template consist of 3 pages of pattern, the first page is the main minion parts, second page is where the helmet is and the last one is the stormtrooper blaster. There will be new minions movie this year, I can't wait to watch it.